On the evening of March 12, 2013, I was treated to a pleasant view of the 1.26 day old Moon (1.8% illuminated) and comet C/2011 L4 Pan-STARRS from 07:00pm to 07:20pm local time Mesa, Arizona. I had an excellent view of the clear western sky and I could see the comet naked eye about 6.5 diameters to the south of the Moon. To assist in making the rough graphite sketch I used a 5x 50mm finder scope removed from an Orion telescope. After returning home from Arizona to Illinois I made a color drawing from field notes and the graphite sketch. I was planning on a color sketch but the number of colors need and blending seemed too much for the 30 minutes to comet set. Graphite pencils: 6B, 4B and 2B also black and white pastel pencils on white sketching paper. Color drawing was made with black and white charcoal pencils and an assortment of color pencils on medium blue paper. Lovely courful record of this visitor to our solar system. Beautiful job!!! I love the detail and the coloring. I had a chance to view it in a pair of 25X100 binoculars from a dark site here in Texas on 3/11, stunning object. 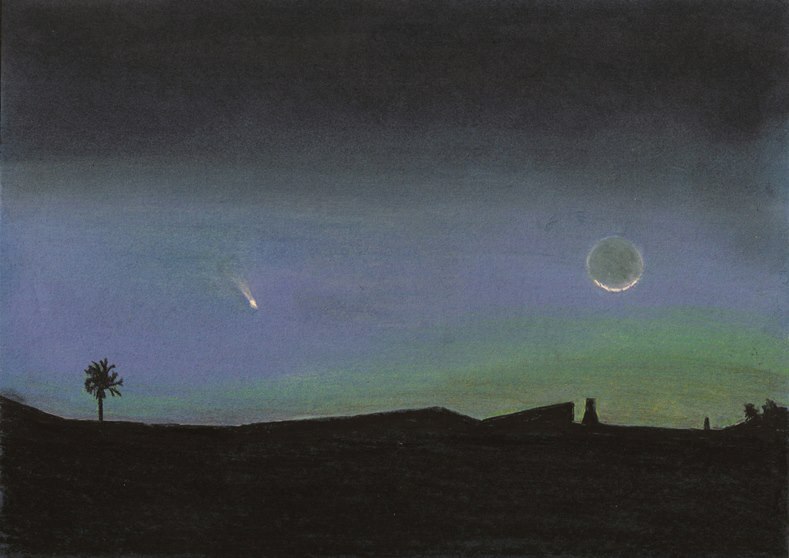 The picture gives me a warm feeling and an accurate remembrance, this day was the only I was able to observe the comet as well. Beautiful details. Unfortunately it is cloudy here in São Paulo this week. Thank you all, I consider myself fortunate to get this clear evening for the view of the young Moon and comet together. So nice Frank. This is exactly the kind of sketch that give us the idea of what´s happen in the sky. Beautyfull sketch Frank!! yesterday,finally,after days of bad weather,i see the comet and i made one sketch,today i hope to made other sketch with my big bino 25×100.Bravissimo! Thank you and good for you, I glad you got to see the comet and were able to sketch it. Good luck with the big binocular sketch. You capture such scenes like few others can! what a nice sight of the comet!! Thanks for this great sketch!! I was very lucky to be in a good location on that specific evening, if I had been home in Illinois; I would still be waiting for my first look.